Earthquake faults come in very different flavors. No, we are not talking about the classic distinction based on the direction of movement of the two flanks of a fault, like a normal, a thrust or a stike slip fault. When he is talking about different flavors, the blogger means more subtle differences. Think for instance about how many earthquakes happen on a given fault segment during a certain interval of time. First and foremost, of course, the number of quakes depends on the strength of the tectonic activity along the fault line. If there is no plate movement, well, there won't be any quakes, because there is no tectonic stress to build up. But even with significant tectonic activity, some faults may not show any signs of seismicity. Such faults are "locked" - and they are the most dangerous beasts in the seismological family. The reason they are so hazardous: Locked faults act like an absorber of tectonic energy. For years, decades and sometimes even centuries such faults pick up the movement of the plates and store the resulting tectonic stress. Unfortunately, their storage capacity is not infinitely large. At some point, exactly when the stored tectonic stress overcomes the frictional and mechanical resistance within the rocks, the fault breaks suddenly and explosively - usually resulting in a large, catastrophic earthquake. One example of a locked fault is the long segment of the San Andreas Fault stretching from south of Parkfield across Tejon Pass almost to San Bernardino. This section last generated a big, destructive quake in 1857, called the Fort Tejon Earthquake. Since then, it has been locked and is collecting tectonic stress. The other extreme is a "creeping" fault. Creeping faults do not accrue any tectonic stress at all. Instead the underlying movement of the plates shows up directly along the fault line at the Earth's surface. The two sides of the fault glide past each other - as if they had been lubricated and lost all resistance. The famous shifting curbs in Hayward, which were recently removed, are one example showing fault creep. Another impressively creeping fault is the very southern end of the Calaveras fault in the town of Hollister. We can also see fault creep wherever the San Andreas Fault crosses California Highway 25 south of Hollister. At these crossings the asphalt is cracked in a distinctive pattern. Unfortunately for us seismologists, nature is rarely black or white. Most earthquake faults are neither fully locked nor are they freely creeping. Instead, they exhibit more complex behavior. They can be mostly locked, but may also release some of their stored energy in small earthquakes and they may even show a small amount of shallow creep along the surface. Such faults are called "hybrid", like a hybrid vehicle, which sometimes runs on electricity and at other times is propelled by a gasoline-powered combustion engine. The earthquakes on such hybrid faults usually come in bunches, a sequence of temblors which we call a cluster. 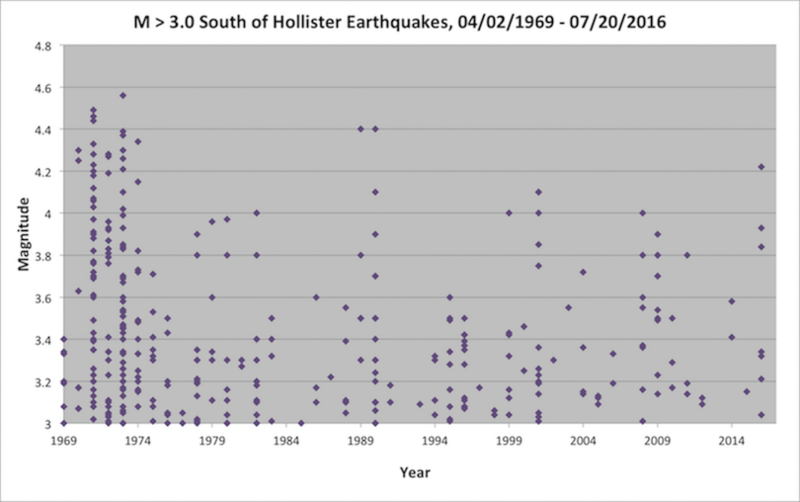 During the last fifty years, the earthquakes near Tres Pinos did not occur randomly, but in clusters instead - like the current uptick in seismicity. 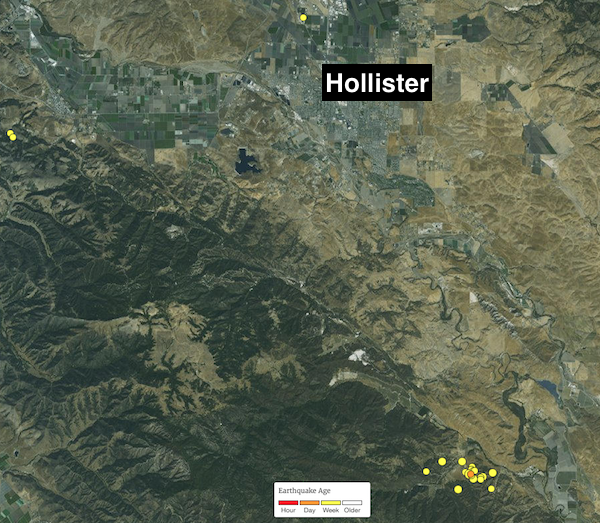 One area in northern California where the San Andreas Fault shows a hybrid behavior and typically releases its seismic energy in clusters is the section south of Hollister near the hamlet of Tres Pinos. Every few years, the town is rattled for a few weeks by a dozen or more earthquakes with magnitudes of less than 4.5. Then everything calms down again for some months or years. The current seismic activity near Tres Pinos is such an earthquake cluster.